Sunday 3rd July. A Sunday Ride in Jersey. 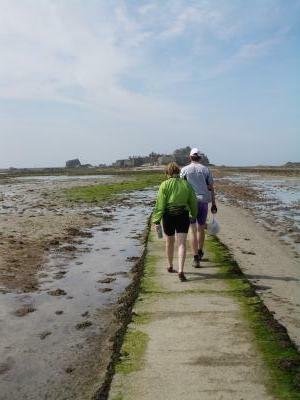 Today was part of a 5 day trip where I joined Jeff and Beatrice Lander exploring the Channel Island of Jersey. Weather was warm and Sunny about 22c. We were staying at the new YHA at Gorey on the east coast. The YHA had converted the premises previously used for the filming of Bergarac's Offices. The premises are also close to the famous Mount Orgueil Castle dominating Gorey Harbour. Our ride today was across to the far SW corner. We first headed across to St Hellier on the Southern coast taking one of 7 signed cycle routes which criss cross the Island. The main roads can be busy but there is a great network of minor roads. Many of these are the Islands "Green Lanes". These are very narrow, often only just a cars width and with a speed limit of 15mph. As a result very few cars use them. Our first stop of the day was to visit Elizabeth Castle built on a rock in the bay off St Hellier and only accessible 2 hours either side of low tide by walking along a causeway. 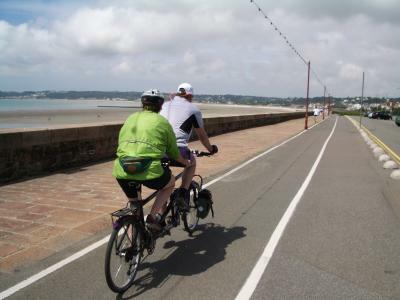 We continued the ride on the cyclepath along the prom around the bay to stop for Lunch at St Aubins. In the afternoon we took in the views from the Portelet Peninsular with German Gun emplacements. Then on to the far SW corner and a tea stop at Corbiere Point overlooking the lighthouse. We returned to St Hellier via a Cyclepath on an old railway path and then headed inland and back on more signed cycle routes on lanes. This ride was nominate leader on the day and Harvey did the honours. Other riders attending were Avryl, Jill and Richard. Richard had to go back from the elevenses stop. Weather was overcast but dry. The ride was via Whiteways and Amberley to stop for elevenses at Wiggonholt. The ride continued to Wisborough Green via West Chiltington. The afternoon tea stop was again at Wiggonholt. Due to adverse weather conditions, (high wind and heavy downpours - what else can you expect in June?) this ride was abandoned at the start point. Sunday 26 June Picture, Beach House Cafe. Sunday 26 June to Beach House Cafe West Wittering, Walberton Pond Start. This was the short alternative Ride to Arthur’s easy 100 mile ride. I deputised for Philippa who was unable to make it. There were 4 of us at the start, myself, John Maxim, Harvey and Christine. Adrian and Eric joined us for lunch at the cafe. The day was pleasantly warm and sunny all day. Temperatures got up to 22c with lower humidy and a fresh NE breeze making it feel less oppressive than recent days. The outward route took in Eastergate, Oving, Merston and Hunston. We then took the canal towpath to the Donnington road and another stretch of the canal to come out opposite the road to the Yacht Basin. We stopped for elevenses at the Yacht basin cafe. We took more lanes via Birdham Pool and Birdham to West Wittering. Lunch was on the Balcony of the Cafe. John ordered mushroom soup and chips. We watched in a little amazement as he poured some of the chips into the soup. We were nearly ready to leave when the 100 mile group arrived after their first 50 miles. There were 15 in the group including some of Arthur’s friends from the Moulton Club. They had started with 19 but 4 didn’t come all the way. Our group left the 100 milers to their lunch and headed back on lanes via Bracklesham and Earnley. From the Selsey road we took a track and lanes to Fisher and Runcton to stop for tea at Manor Garden Centre, Runcton. We headed back via Merston. I left the group to head home at Oving. Approximate mileage from and back to the start was 37. Not exactly related to a Club Ride but a bit of interesting local news follows. Today Sean Yates took part in the Bognor Regis Cycling Club annual Open 10 mile Time Trial held between Fontwell and Chichester. For those not in to these things Sean Yates comes from East Sussex and raced a lot in the big Continental tours including holding the Yellow Jersey of the Tour de France for a few days in 1988. He is now assistant Directeur Sportif (Race Team organiser) of Lance Armstrong’s Discovery team (formerly US Postal). On a calm warm evening there were a lot of fast times but Sean Yates was the clear winner with a time of 19 minutes 56 seconds for the 10 miles ( a fraction over 30 mph average speed!) The picture is of Sean Yates at the start at Fontwell. by another four riders who arrived from Bognor. Leaving Felpham we headed for Bognor seafront, and threaded our way through the traffic of the West End and Aldwick before heading into open country along the Lower Road and the Park Farm byways. After diverting through Mundham village we reached Hunston where we took the canal towpath to Donnington, stopping en route to inspect the old alignment of the former railway to Selsey. Donnington Bridge was soon reached, and we arrived at our destination to find the Chichester group "Diners Club" enjoying their meal. We returned to Felpham almost entirely by road, although we diverted again through the tracks at Park Farm. Felpham was reached, still with the last of the daylight, at 10.15pm. Mileage from start, back to start point, a very modest 18. Arthur was away on a late arranged holiday to the Dordogne so I substituted as Leader. Weather was unbroken sunshine and hot. Weather records showed a maximum for the day of 25c but it felt hotter with high humidity. We met at 10.00 at the Cross. 9 of us started out, myself, Alan, Bruce, Gillian, Freda, Jim, Roy, Sonja, and a newcomer from Chichester Mike Trussler. Adrian joined us at Bosham. Eric, Clare and Vernon joined us at Rowlands Castle and Dave and Jan joined us at West Stoke so 15 were out at one time or another. We headed over to Bosham taking the winding lanes to Bosham Hoe and the Harbour road with good views across the harbour. We stopped at the harbour front cafe. We had a short delay while Adrian mended a puncture. We took the usual route on the South Coast Cycle Route lanes to Rowlands Castle where we met up with Arun Adur members including the 2 Dave’s, Fox and Galle and the 2 John’s, Maxim and Wickens. In the afternoon we took a fairly direct route back via Funtington to West Stoke hall arriving dead on opening time of 3.00. Dave said I was improving. Unfortunately the motorists had arrived much earlier and bagged the outside tables. We found a bench outside at the side of the hall where we could shelter from the sun. Somebody made a comparison with sheep huddled together in the shade. After lots of tea and cake we headed back into the still hot air to complete a very pleasant days ride. Mileage from and back to start point - 35.